← Video – What does First Fruits have to do with Tithing? The “righteous deeds” Isaiah has in mind are most likely the perfunctory rituals offered by Israel without sincere faith and without wholehearted obedience. In Isaiah 65:1–7 the Lord rejects Israel’s sinful sacrifices. They are an insult to the Lord, smoke in his nostrils, just like the ritual “obedience” of Isaiah 58 that did not impress the Lord because his people were oppressing the poor. Their “righteous deeds” were “filthy rags” (64:6, KJV) because they weren’t righteous at all. They looked good but were a sham, a literal smoke screen to cover up their unbelief and disobedience. But we should not think that every kind of “righteous deed” is like a filthy rag before God. In fact the previous verse, Isaiah 64:5, says “you [God] meet him who joyfully works righteousness, those who remember you in your ways.” It is not impossible for God’s people to commit righteous acts that please God. Those who bear fruit in every good work and increase in the knowledge of God are fully pleasing to God (Col. 1:10). Presenting your body as a living sacrifice pleases God (Rom. 12:1). Looking out for your weaker brother pleases God (14:18). Obeying your parents pleases God (Col. 3:20). Teaching the Word in truth pleases God (1 Thess. 2:4). Praying for the governing authorities pleases God (1 Tim. 2:1–3). Supporting your family members in need pleases God (5:4). Sharing with others pleases God (Heb. 13:16). Keeping his commandments pleases God (1 John 3:22). Basically, whenever you trust and obey, God is pleased. Why do we imagine God to be so unmoved by our heart-felt attempts at obedience? He is, after all, our heavenly Father. What sort of father looks at his daughter’s homemade birthday card and complains that the color scheme is all wrong? What kind of mother says to her son, after he gladly cleaned the garage but put the paint cans on the wrong shelf, “This is worthless in my sight”? What sort of parent rolls his eyes when his child falls off the bike on the first try? There is no righteousness that makes us right with God except for the righteousness of Christ. But for those who have been made right with God by grace alone through faith alone and therefore have been adopted into God’s family, many of our righteous deeds are not only not filthy in God’s eyes, they are exceedingly sweet, precious, and pleasing to him. Do the good the Lord has specifically prepared in advance for you to do. It truly will bring him delight–and it will bring you into greater knowledge of his character as well. 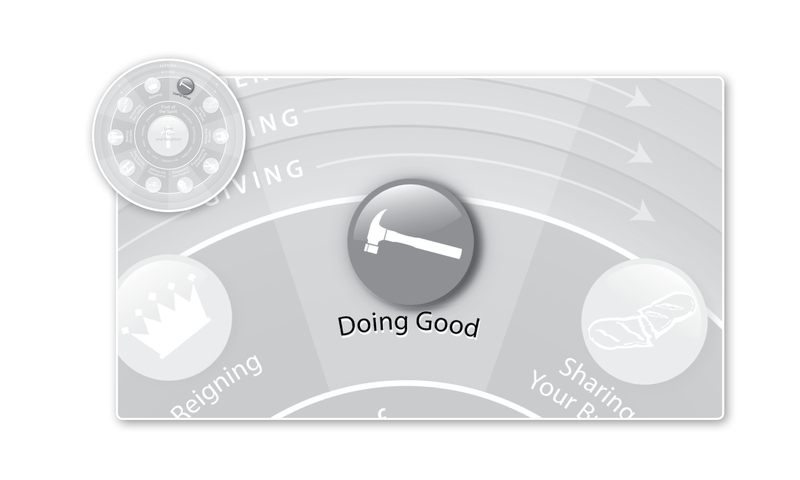 This entry was posted in Doing Good and tagged holiness, righteousness. Bookmark the permalink. An excellent gift of clarity. When God said, all are like filthy rag he was not referring to all as the entire world he was speaking about those who was of the flesh who said in their hearts there is no God they are the children of men and not the children of God Psalms 14 :4 would show you who he was speaking of . Although the scripture said by one man’s disobedient all were made sinners; but all are not sinners because Christ said ” whosoever is born of God do not commit sin for his seed remaineth in him and he can not sin because he is born of God” So if all are sinners and are like filthy rags that would include John the baptize and Jesus and they both were no sinners, not even Adam and Eve because where there is no law there is no sin, when God said not to eat of the tree of knowledge of good and evil at that time he had not made that a law,that is why adam did not sin, he was only disobedient, and he knew he was disobedient so he sew leaves to cover him self which means he commended his ways unto The Lord but God had to judge them and punished them by telling Adam he had to tilt the ground, sin was never mention in genesis until God told Cain, sin lieth at the door, when Adam and Eve ate of the fruit, that is when sin entered into the world but was not committed until Cain slew his brother Able, by one man; sin entered into the world that was because Adam had Cain and the woman said The Lord had given us a man child, if she Eve had said The Lord God have given us a child and not Lord alone, Cain would of being a perfect child of God, born of God and not born of The Lord because Lord means flesh which is Jesus who was also in the garden talking to Eve,so therefore that was not satan talking to Eve in the garden he came in the form of a man that is why God said look the man has become as one of us to know good and evil.